♫ Walking in a Winter Wonderland ♬ You’ll start caroling a holiday tune once you see these beautiful Christmas themed ribbons! 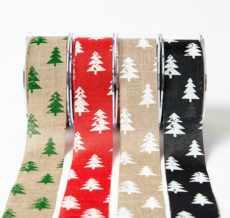 Reindeer, Snowflakes, and Christmas trees come together to create the perfect holiday themed ribbons. Available now in a variety of three colors.